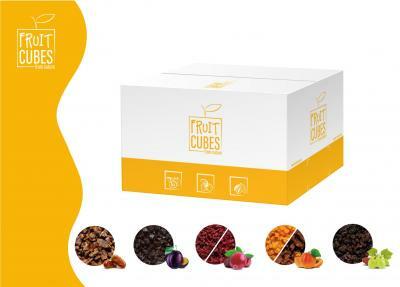 FRUIT CUBES are made of 100% dried fruit, incl. apricots, dates, cranberries, raisins and plums. Thanks to advanced production processes, dried diced fruits FRUIT CUBES preserve its natural color, taste and smell. The products do not contain dyes, aromas and other flavor enhancers. FRUIT CUBES do not require cutting, what makes it suitable for immediate use, which reduces production time and costs. The unique visual and taste features makes the products an increased range of applications, intended not only for the preparation of cakes, desserts and bread, but also for the production of chocolates, pralines, nut mixes, cereal bars, muesli mixes and even yoghurt fillings.